One of datacenterHawk's most-used online tools is Hawk Search. Data center professionals use this simple yet powerful way to find colocation, cloud, or land site solutions anywhere in North America, then make strategic decisions based on our real-time data. 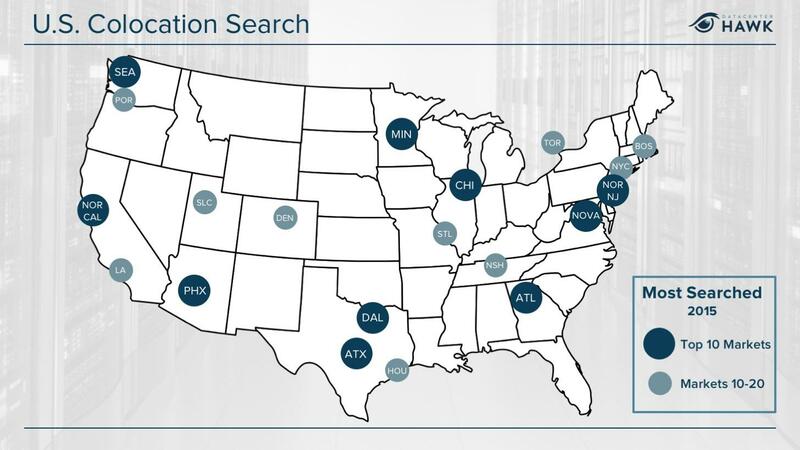 Atlanta, Chicago, Dallas, Northern California, Northern New Jersey, Northern Virginia, Phoenix and Seattle captured a majority of search for 2015. The big markets are getting bigger. Major supply is being added to Northern Virginia (currently 426 MW), Dallas (currently 270 MW) and several other primary markets as well. Larger providers have doubled down in key markets, including Digital Realty, DuPont Fabros, and Equinix in Northern Virginia as well as QTS and RagingWire in Dallas. Large transactions land in Primary Markets. The majority of companies with large colocation transactions find a home in the big cities. Larger colocation transactions find value on campuses that can either quickly accommodate the power need or provide the user an option to control their own building. These secondary markets typically attract smaller transactions (250 kW – 1 MW) from companies that are in region. Occasionally, companies with larger requirements evaluate and head to secondary markets, as was the case with Infomart Data Centers landing LinkedIn earlier in 2015. Minneapolis in Top 10 for 2015. Why did Minneapolis land in the Top 10 most searched markets in 2015? Over the past few years, several data center providers (Stream Data Centers, Compass Data Centers, ViaWest, and DataBank) invested heavily in the market. Minneapolis is home to many Fortune 1000 companies that typically have larger data center requirements, and the Minneapolis data center market now provides a compelling reason to house a company's IT infrastructure in the region. Austin in Top 10 for 2015. While this might be surprising, Austin's tech growth and its proximity to Dallas has increased interest and activity on our platform. Denver rising. Denver averaged in the Top 20 for 2015, but cracked into the Top 10 in Q4. Denver is home to CoreSite, ViaWest, and FORTRUST, and several other providers (e.g. CenturyLink, Stream Data Centers, and zColo) have a strong in-market presence there. The Denver market is increasingly becoming a tech hub with a well-educated workforce and central location for data centers. Toronto and Montreal are consistently searched on our platform as well, and it's our prediction this Northern market evaluation will continue. Canada's recent data center activity stems from both lagging supply as well as perceived data residency concerns, where companies avoid legal liabilities related to U.S. data privacy laws by storing data in Canada. To sign up for a trial of datacenterHawk and get more information about data center markets, providers, and industry leading tools, register at http://www.datacenterhawk.com/register.